Editor's note: Australian Prime Minister Malcolm Turnbull's Liberal–National Coalition won the most seats in July 2 legislative elections, a result expected to return him to office. Originally published under the title "Guess Who's Coming to Iftar?" Australian Prime Minister Malcolm Turnbull thinks that his Iftar dinner guest, Shady Alsuleiman, should "reflect on what he has said" about homosexuals and adulterers. 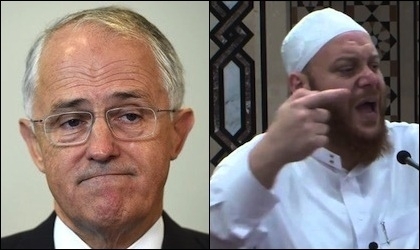 A widely-publicised Iftar dinner, intended to show that Malcolm Turnbull gets what it means to be inclusive, ended badly after he was advised that one of his guests, Sheikh Shady Alsuleiman, had taught that Islam prescribes death for adulterers, and homosexuals spread diseases. No rogue maverick, Australian-born Alsuleiman is the elected national president of the Australian National Imams Council. Although insisting that "mutual respect is absolutely critical," Turnbull subjected this prominent Muslim leader to public humiliation. He regretted inviting him to dinner and counselled the sheikh "to reflect on what he has said and recant." In the middle of an election, wanting to limit fallout from the dinner-gone-wrong, held only days after the Orlando massacre, Turnbull stated that his no-longer-welcome guest's views are "wrong, unacceptable, and I condemn them." Well, Mr. Turnbull may deplore Alsuleiman's teachings, but the real challenge is that these were not merely his personal views. The sheikh's teachings on homosexuality and adultery reflect the mainstream position of Islam, preached by many a Muslim scholar around the world today. Telling a sheikh to reject the sharia is like telling a pope to get over the virgin birth. Western leaders pretend that the objectionable teachings of Muslim faith leaders are personal faults. Many Australian Muslims will be disappointed at the treatment meted out to Sheikh Alsuleiman. An event designed to honour the Muslim community ended up providing a platform to denigrate one of their most respected leaders for promoting Islamic doctrines. Several Australian Muslim leaders have since dug in their heels to affirm support for the sharia position on homosexuals. So much for recanting. While Turnbull refused to pass judgement on Islam itself, saying "there are different views of different issues, as there are in all religions," he also sent a message that he is prepared to disparage Australian Muslims' religious beliefs. It was a bitter pill for Muslims to swallow that this came in the form of a humiliating invite-to-disavow game of bait-and-switch, conducted during a pre-election media storm. The cognitive dissonance is startling. On the one hand, Mr. Turnbull has stated, "I reject and condemn any comments which disparage any group of Australians, whether on the basis of their race, their religion, their sexuality, their gender." On the other, he is willing to disparage one of Australia's most prominent Muslim religious leaders on the basis of his religious teachings. Turnbull has also said "It is vital in our multicultural society that every part feels included and that each of us gives to the other the mutual respect that each of them gives us." A video response posted on Sheikh Alsuleiman's Facebook page, and viewed more than 40,000 times, asks, "But that statement also includes respect for people's religious beliefs, doesn't it?" Turnbull and others subscribe to the idea that the same basic values are channeled by all religions. Turnbull appears to subscribe to the really bad idea that the same basic values are channeled by all religions. In 2011 on Q&A he praised Islam's moderation in embodying "universal values." This vacuous universalism has blinded him to the possibility that a religion might actually teach things that he would be duty-bound to disparage. No doubt the PM is also influenced by advice from ASIO not to alienate Muslims by criticising their religion. This policy is ultimately driven by fear of offending adherents of the one religion from which most terrorists are drawn; and why millions of dollars are directed to Muslim organisations, and not to Sikhs or Copts. Turnbull attempted to use a "shoot the messenger" strategy to minimise the cognitive dissonance of his conflicted statements, directing attention away from the religion onto an individual. The fact remains that, whatever the sheikh's personal attitudes to gays, his teachings on adultery and homosexuality are not personal. Given his extensive training in sharia law, Alsuleiman's views could only be called personal if they had diverged from mainstream Islamic positions. But they did not. Turnbull's staff might have googled the sheikh before they invited him to dinner. And as Alsuleiman's Facebook post put it, "the prime minister might have the same issue in future when inviting just about any other Muslim imam to any other function." Rather than calling out the sheikh as a hater, what is needed is to challenge the religious doctrines which have determined his preaching. As long as our political leaders pretend that objectionable Islamic teachings are merely personal faults, while insisting that the religion of Islam is above reproach, we will stay stuck in this unhelpful place; where we tell a highly trained Muslim imam that we respect his religion, but denigrate his religious beliefs as bigotry. The conversation needs to be about Islamic sharia, not those who preach it.